For many adults the incidence of headaches after age fifty actually decreases and this can be a welcome relief. 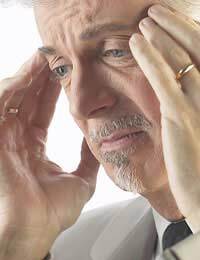 Those over fifty are less likely to suffer from migraines and cluster headaches. For others, however, headaches continue to be an enormous problem and may even begin due to other diseases and medications. One unusual headache that occurs in older adults, particularly those over age sixty-five, is a condition called hypnic headache. When this occurs, a person awakes during the night and experiences a headache that lasts for approximately half an hour. A typical pattern would be awakening once or twice during the night with head pain. The pain usually occurs on both sides of the head and stomach discomfort may also be present. Migraines tend to decrease in frequency and also in severity, although visual disturbances may now be present without pain. Your medication and preventative treatment plan will need to address the changes you experience in your headache symptoms. Overall, treating migraines in older adults is similar to recommendations for all migraine sufferers. Non-prescription guidelines such as monitoring diet, keeping a consistent sleep routine and icing the afflicted area on the head are still preferred. There is some thought, however, that alternative therapies such as acupuncture and yoga are not likely to be as effective in an older cohort. This is, in part, due to physical limitations that may be present and also due to complications from other health conditions that may begin as people age. When medicating, your doctor may prescribe a lower dose to treat your headache than is commonly used with a younger patient. As people age, their ability to metabolize and excrete drugs diminishes, so an equivalent dose to their younger counterparts could potentially be quite dangerous. Therefore, your response to the same drug changes as you age. Your doctor will choose an appropriate medication based on any co-existing medical conditions such as heart abnormalities. Amitriptyline, propranolol and verapamil are still used for migraine treatment, generally to prevent migraines from occurring. One particular benefit with anti-depressant use in older adults is that these medications are often able to target both depression and headaches simultaneously. Beta-blockers may also be prescribed and used similarly to the recommendations for younger adults. Hypnic headaches are often treated with indomethacin. A major challenge in medicating adults over 50 is the presence of other conditions. Gastrointestinal and cardiac problems are more common and it can be frustrating for adults to have to take many pills each day to treat the entire array of ailments. Be sure to ask your doctor questions regarding side effects and try to maintain a support network of family and friends. If you have a lot of medications to take in addition to your headache prescription, and find it difficult to keep track, try purchasing a pill compartment. These organize medications into daily doses and some even have separate compartments for morning and evening doses.